Don't read the comic strip before playing. Lol, nicely done on the 3d translation. Not much of the game (or at least I couldn't find much to play with), but a cool take on the comic nonetheless! A 3d game version of the comic it's based on--I like it! :) You replicate the style very well in 3d, and I also like how you put the comic in the game itself to sort of explain the joke for those who won't understand right away. No music. Maybe this game doesn't really need it--but it would've probably made the time machine stuff clear if there was music, though, and the track playing restarts whenever the player goes back in time. Just one way you could have explained the joke clearer. 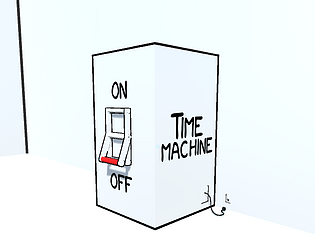 The sound effect for the time travel is a good one, as is the switch and plug sound--well chosen! The best way to help guarantee that is with subs ! So Sharing this video would be great !